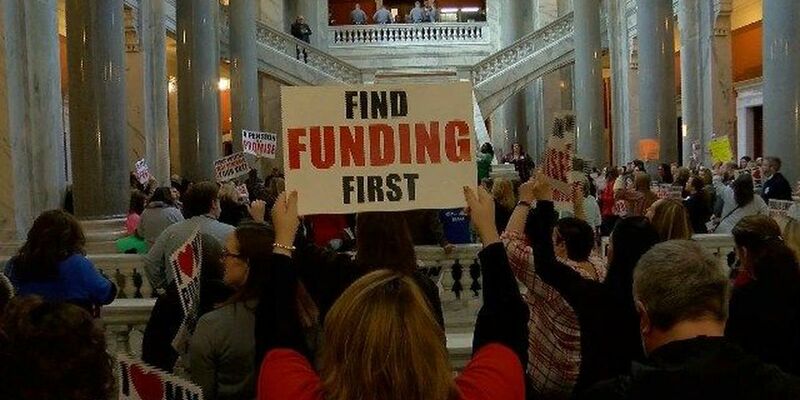 FRANKFORT, KY (WAVE) - Hope for fixing Kentucky's $40 billion pension crisis continues to dwindle as the Senate State Government Committee failed to take up Senate Bill 1 on Wednesday. The bill was sent back to committee after senate leaders put off a vote on the legislation last week. + Is it a case of time out or time's up for pension reform? GOP leaders are trying to bring Republicans opposed to the measure in line but are having trouble securing a majority. The bill would cut some cost of living increases for retired teachers. That plan has been met with fierce resistance from teachers. More than a thousand teachers rallied outside the capitol in Frankfort on Monday. Gov. Matt Bevin, who has made pension reform his top priority, had quite a bit to say to teachers in opposition to the legislation on a Campbellsville radio show Wednesday. "This is a group of people that's throwing a temper tantrum and I'm surprised," Bevin said. "To me, if they get what they wish for, they won't have a pension system for the younger people who are still working. And for me, that is remarkably selfish and shortsighted." As educators, we were shocked today by the disrespectful verbal attacks leveled at the teachers of Kentucky by Governor Bevin. As public school educators, we earn a modest salary and spend our own money on classroom supplies, and sometimes even on food and clothing for our students. We have dedicated our lives to making a difference, one student at a time. And we deserve better than to be disparaged by the highest office-holder in our state. Bevin claimed Kentucky teachers are paid more than teachers in surrounding states. He pointed out that teachers are the only public employees that receive pay hikes in retirement.